At least three days a week, Grandmaster Caz boards a small bus packed full of foreigners and introduced them to the sights and sounds of the Bronx. Especially the sounds. Caz, while taking his group through the historic corners of the borough, raps to a captive audience along the way, many of them decked out in New York t-shirts and Yankee snapbacks. Caz, a Bronx native, recording artist and old-school MC in his own right, has been a hip-hop ambassador for the last 13 years as a guide with Hush Hip Hop Tours. Caz introduces tourists, from New York and beyond, to a borough that lacks the Empire State building and Statue of Liberty, but is a holy grail for hip-hop enthusiasts. "The whole point of this tour was to help increase tourism in the Bronx," Caz said. "Every place in New York showcases something, Broadway celebrates dance and plays. The Bronx is the birthplace of hip-hop, and the world has to know, and New York has to advertise it." Tourism in the Bronx is up 14 percent, according to Fred Dixon, President and CEO of NYC & Company. Last year, 56.4 million people visited New York City, and the city is on track to see 67 million visitors by 2021. The Bronx Tourism Council put out their first visitor's guide to the borough in 2015, and NYC & Company is forming a tourism committee to help Bronx businesses and attractions promote themselves to the tourists. "Ladies and gentlemen, we're now headed to the birthplace of hip-hop, 1520 Sedgwick Ave. But we can't go like this, it's way too quiet on this bus right now? Are you ready to turn it up? Tell the sound man to turn it up," Caz tells the enthusiastic riders before his rendition of Grandmaster Flash and the Furious Five's "The Message." The passengers say "ho" to his "hey" on the way to the apartment building that overlooks the Major Deegan Expressway in the west Bronx, where DJ Kool Herc, who is credited with starting the genre, he held the world's first hip-hop party in August 1973. 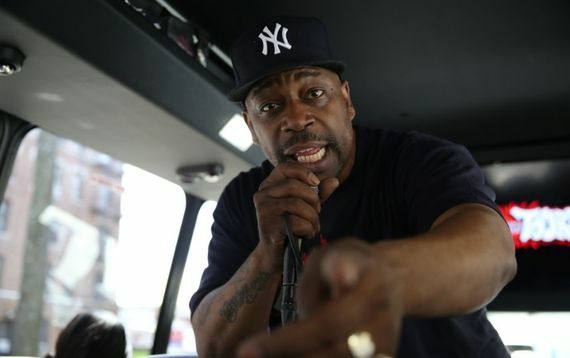 In between Caz's renditions of old school standards, as well as his own verses, the bus swings by murals, including one on the Grand Concourse outside the Andrew Freedman home, and to Caz's Bronx walk of fame spot. The tour ends in Harlem with a trip to Big L's memorial mural at the corner of Malcolm X Boulevard and West 140th Street before a soul food buffet lunch at Manna's. "I've been listening to hip hop music since I was 6 years old. I'm 33 now, and I've always wanted to come to New York, and of course I had to do a hip-hop tour," said Ryan Langbien, who was visiting for the first time from Sydney, Australia. "It was awesome, being right there where Big L's mural is." "We probably wouldn't have come here unless we went on the tour. We probably wouldn't have taken the train up," said Gwen Jones-Libens, who was visiting from Great Britain. "Hip hop is one of the most universal things going on on the planet right now, one of the most positive, and I think its appeal remains intact," Caz said. "I think people are at a different time in hip-hop when they want to learn about where it comes from, and that's basically what we do."